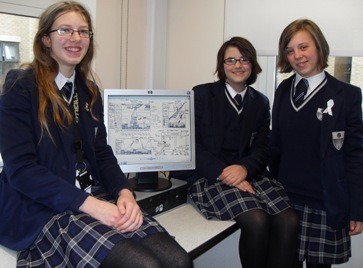 Three Y9 girls were delighted when a computer game which they designed was in the running for a prestigious BAFTA award. Amelia Webb, Katriona Lawrenson and Elizabeth Kracik-Dyer reached the final 10 in this year’s BAFTA Young Game Designers Award. The competition was open to 11-16 year olds in teams of three and attracted hundreds of entries from around the country. Katriona and Elizabeth, who are both members of GSAL’s ICT after-school club, designed the game, entitled Finger Wars. Amelia acted as trouble-shooter, pointing out issues with the game, and working with the team to solve them. Pictured with their computer game onscreen are (L-R) Elizabeth Kracik-Dyer, Katriona Lawrenson and Amelia Webb.